The Manchester small-scale multiplex will be switching to all-DAB+ service and launching nine more stations from the end of May. This will bring the number of services available to 28 – making it believed to be the most-populated DAB multiplex in the World. There are currently 10 small-scale DAB multiplexes on air in the UK and last month legislation was passed which will enable Government and Ofcom to create a regulatory regime for the licensing of local commercial and community radio stations on small-scale DAB multiplexes across the UK. DAB+ compatible radios are widely available, and all radios with the Digital Radio Tick Mark are able to receive DAB+ stations. 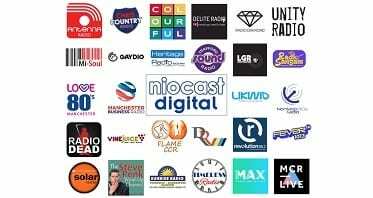 The full line-up of stations on the Niocast multiplex can be found at www.niocast.com.